Besides working on the rules and descriptive text for the Expansion Rules, new final art is starting to arrive. We've created a ink and other finished Art gallery right here. 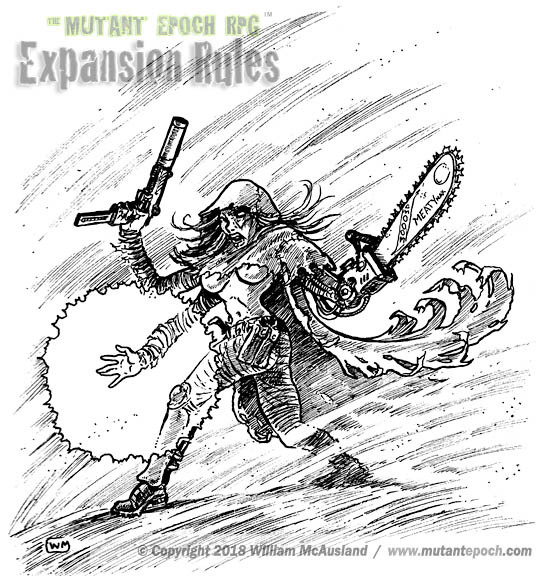 Welcome to The Mutant Epoch Expansion Rules page. Bookmark this page as it will be the permanent homage for this new book upon completion and release. In the meantime, this area will be a central redoubt for everything to do with this huge project. To start with, we are going to continuously post the latest version of the Table Of Contents, showing you what's going to be included in the book, although some mutations, implants, and relics might be removed, renamed, or moved to other sections. For example, if the random ruin, robot and mutant creature generators turn out to be too big and involved, each might become their own, much smaller, sourcebooks. Also on this page is a thumbnail gallery, shown immediately below, which showcases sketches and thumbnails from forthcoming book. Some of these will later be turned into digital grayscale paintings, inks, or might even appear as characters on the book cover. Just click a thumbnail that interests you, or else, start with the first image and it will take you to the sketchbook section of our site, which will take over the current sketchbook area. See your name in print and probably* get a piece of original art! As those of you who received our latest newsletter might recall, we are putting out a request for fan created mutations, flaws, minor mutations, cybernetic implants and relics to be added to this book. The Epochian community has already submitted plenty of additional material for consideration - most all of which will appear in the book - and where overlap of ideas occurs, especially among new Bestial Human types and mutations we will credit all contributors involved. While we might not be able to incorporate everything we receive in this book, or it arrives too late in the layout process (date to be announced but still months away) it will all be made available someplace prominent. Items and additions that get included in the book will be credited to the fan who sent it in, or contributors if incoming ideas overlap. Besides credit we will give you the PDF version of the book free, and better still, we'll send you the original ink art or sketch (if used as digital art in publication) that might accompany* the listing; but keep in mind, I work at a 1 to 1 ratio so much of the art will by the size you see it in the book... so yes, small and easy to mail and frame. We do ask that you come up with your own content, instead of TME visions adopted from other RPGs. While you can get an idea from a movie, comic, novel, real life (relics) computer game or other rpg, please let me know the source or inspiration if possible, and how you've improved on or changed it to make it fit the Outland System and avoid any blatant plagiarism. With so much media out there, I can't possibly be aware of everything in publication, so require your judicious oversight on any submission. The degree of detail in a submission can range from a few sentences to a completely finished and game ready mutation or relic, with suggested stats. While I can't guarantee that your offering will go unchanged, I for one certainly appreciate a 'play test ready' variant of whatever you send in. Not already on the list for Outland Arts Insiders, our newsletter, and want to be notified when the book hits the virtual shelves at Amazon and PDF sales venues? The contact me here and say 'Newsletter' in the subject line. Learn more about the newsletter here. PS. Please share this page link online, and if you have a blog, Instagram, Pinterest, twitter feed or website of your own and want post any of these sketches (unaltered so the copyright and all important mutantepoch.com web address shows) then please do! *As with some of the mutations and implants in the Mutant Epoch Hub Rules, not every item has the a space or need for an illustration. That said, as the creator, and artist, I will do my damndest to see that I can illustrate your submission. Also, if you have more than one new mutation or implant or relic that you and your fellow TME gamers have enjoyed at your table, why not send these along, too? If we use more than one contribution, you'll get the art for the additional features as well. A mutant human who has undergone cybernetic enhancement, having less mutations than most mutant characters, and likewise, few implants, but still, a potent mix. A often hideous miscreation, blob-like at times, with the DNA of both humans and animals and gifted with a mix of mutations and appendages. A strain of tiny mutant humanoids which while able to move about slowly on whatever disturbing appendages they were born with, they tend to occupy a host human — either upon the torso or within it — controlling the zombified subject in a symbiotic relationship. Parasites have both standard mutations and flaws, as well their own unique, freakish features. See concept art gallery for examples. Each parasite character starts with a separately generated host. Humans, or if the GM allows, mutants, too, who have suffered some great bodily misfortune. and had mechanical and electronic parts bolted, stitched and cruelly adhered or inserted into the subject. Similar to a cyborg, these low tech, junk crafted people use prosthetics and scrap parts, including limbs from androids and robots, bicycle wheels, barb wire wrapped limbs and trash to make themselves serviceable and of use to their people or dig team. They have their own random list of parts, problems and even a random optional list which describes the event that leant to their being initially maimed and who rebuilt them. The product of high tech enclaves and mecha factions. There enhancements tend to be less obvious and easier to conceal then a cyborgs. These potent characters and NPC villains use nanotechnology to repair, enhance and manipulate their body. As they grow in rank, they gain access to more of their inner potential, all the while able to appear as pure stock humans and use the arms and armor of the ancient ones. Humans descended from a strain of subjects who carry Adoptive DNA which allows not only the organs of other people to be grafted to their bodies without the usual risk of the body rejecting the donor part, but so too, animal organs. First introduced to allow medical patients — partially frontline soldiers — accept pig grown organs, but so too, other animal parts including those of unnatural creatures, such as mutant monsters. Characters of this type exhibit a random assortment of extra body parts and organs, plus rules for the medical attachment of additional parts and determination if an appendage is rejected by the body or not. A grafter needs to have advanced medical facilities or personnel to attach new found parts. See concept art for examples. A living human brain in a vat of nutrient fluid. This subject may or may not have additional glands and living organs contained in other sealed jars or compartments which maintain its living gender and reproductive motivations. These rare beings are basically cyborgs in the truest sense, with a living brain housed in some sort of robotic or android body. To The determination of the body that this entity occupies uses many of the same tables as either a unique android or robot, included in this book. A single point of consciousness, and derived either from an artificial intelligence or a downloaded human mind from an long deceased ancient one. This being can only exist in one place at one time, and occupies a hard drive within some sort of ancient device. This character typically starts game play inhabiting the CPU of an android, unique or standard robotic unit, but through cable transfer can be downloaded onto a data stick for transport, or loaded into an ancient vehicle's onboard computer, or else, at higher rank broadcast it's appearance from a safer, central location and appear as a hologram through various devices or emitted from ancient devices. This is a complex character type, and makes for an excellent NPC patron or villain. They can be killedd by the hard drive they occupy being crushed, shot through or corrupted by various relic weapons. Scroll to bottom for current list to avoid contributor overlap. A mechanical person, whose traits and condition of disrepair are all rolled randomly. So too, the character's skills and any mounted cybernetic parts are also determined at the outset. Differing from a digital being, these entities are less fluid in the computers and pathways they can exist in, have hardwired CPUs and typically, when their head is destroyed, they are considered erased and lost forever. They can learn as they endure the ordeals of the twisted new world, improving their skills, enhancing their mechanical body, and advancing as other characters do. Appearing as either intelligent, mobile plants without much if any human DNA, or else, occurr as symbiotic, almost parasite-like growth woven in and through a living human cadaver. 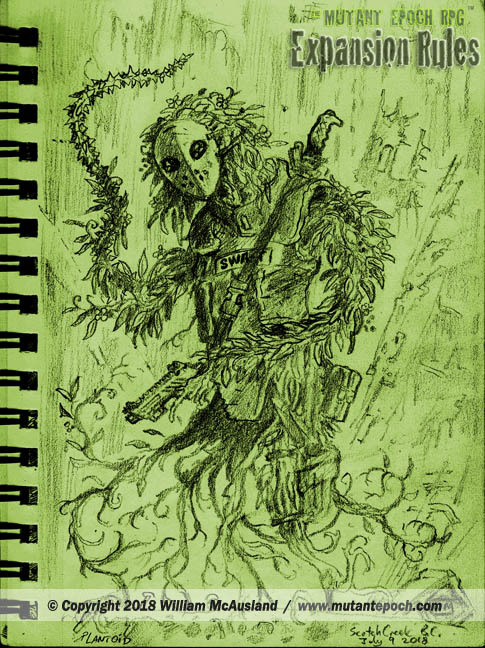 They start game play with several plant mutations from a huge collection, and, being somewhat intelligent, also commence action with weaponry and equipment. Many of these veggie beings wear clothing and masks to allow them to pass in human society when accompanying other 'normal' characters. Interestingly, while meat based individuals must watch for carnivores, plantoids must be careful to avoid herbivores, such as common livestock, especially goats. Similar to unique, self aware androids, these characters occupy a hard drive within the head of a randomly generated robotic body. While able to employ the services of a robotics technician to substitute other appendages from defeated or uncovered robots, they often have odd body shapes and do not pass for humans when entering communities, nor are able to wear most relic armor. If their CPU is shot through or their head is crushed, they are considered killed. Digital beings often occupy the forms of unique robots, and a hostile digital being can attack and hack into and dominate this being, possessing it, deleting the consciousness forever. 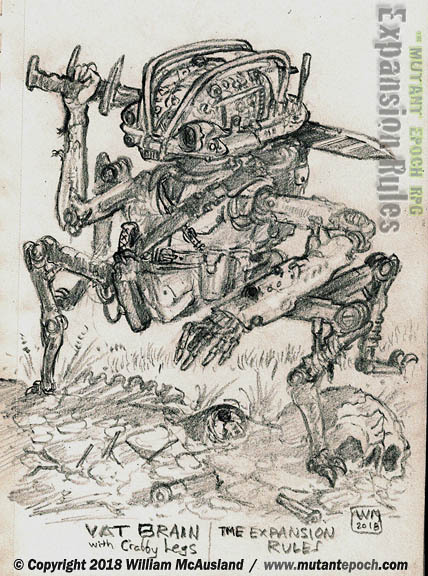 A robust, combat ready unique robot is a welcome asset to any excavation party, particularly one housed in the chassis of an old, modified combot. Of note, at this time we don't know if the random Robot generation tables in the Appendices may or may not be used in the creation of there characters. Glow in the dark (phosphorescent ?